Pakistani President Asif Ali Zardari’s popularity has dropped further over the last year. The once-popular Zardari is now viewed unfavorably by a large majority of Pakistanis. In contrast, opposition leader Nawaz Sharif remains widely popular, as do Chief Justice Iftikhar Muhammad Chaudhry, Army Chief General Ashfaq Parvez Kayani and Prime Minister Yousaf Raza Gilani. Most Pakistanis hold their country’s military in high regard, while many also express positive attitudes about the media, religious leaders, and the court system. On the other hand, many Pakistanis view the national government and police as having a bad influence. Views of Pakistani President Asif Ali Zardari are decidedly negative; 76% offer an unfavorable view of him, while 20% hold a favorable opinion. Negative views of Zardari have increased in recent years; 65% expressed an unfavorable opinion of him in 2009, while just 24% did so in 2008. Unfavorable views of Zardari are equally widespread across most demographic groups. Even among those who are affiliated with the political party he co-chairs with his son, the Pakistan Peoples Party (PPP), opinions of Zardari are largely negative – a majority (59%) has an unfavorable opinion of him while 38% offer a positive opinion. Similarly, in Sindh province, a traditional stronghold of support for the PPP, a majority (56%) views Zardari unfavorably, while 41% view him favorably. In contrast, Nawaz Sharif – Zardari’s primary political rival and leader of the opposition Pakistan Muslim League (PML-N) – remains widely popular. Roughly seven-in-ten (71%) have a positive opinion of Sharif; 79% expressed a favorable opinion last year. Sharif is almost universally popular among those affiliated with his party; 95% of those who self-identify as Pakistani Muslim League-Nawaz (PML-N) supporters offer a favorable opinion of the opposition leader. Sharif also enjoys broad support from those in the PPP (64% favorable). While Pakistanis express largely negative views of Zardari, the vice-chairman of his party, Prime Minister Yousaf Raza Gilani, remains popular, though slightly less so than a year ago. Nearly six-in-ten (59%) in Pakistan have a favorable opinion of Gilani while one-in-four (25%) express an unfavorable view of him and 17% offer no opinion. 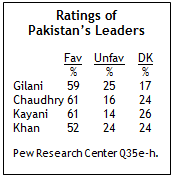 In spring 2009, two-thirds (67%) of Pakistanis rated Gilani favorably. Gilani is well-regarded by members of both leading political parties; 60% of those that affiliate with the PPP see the prime minister in a positive light, and even more (71%) who identify with the opposition PML-N party share that view. Iftikhar Muhammad Chaudhry, the Chief Justice of Pakistan’s Supreme Court, also receives positive ratings. About six-in-ten Pakistanis (61%) hold a favorable view of Chaudhry, who was suspended by former President Pervez Musharraf before being reinstated in March 2009. Only 16% express an unfavorable view of the chief justice and 24% do not offer an opinion. While Chaudhry is widely popular among self-identifiers of both major political parties, more respondents who affiliate with the PML-N (75%) express favorable views of Chaudhry than those who identify with the PPP (63%). Army Chief of Staff General Ashfaq Parvez Kayani receives favorable ratings from roughly six-in-ten (61%) Pakistanis. 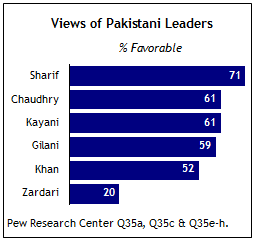 Few (14%) view General Kayani negatively, though about one-in-four (24%) do not have an opinion of him. While widely popular across both main political parties, more among PML-N supporters (72%) voice favorable views of Kayani than among those who identify with the ruling PPP (59%). Imran Khan, a former world class Pakistani cricket player who now leads the small political party Pakistan Tehreek-e-Insaf, is viewed positively by about half (52%) of his countrymen; 24% express a negative view of him and the same percentage offers no opinion. More among the opposition PML-N (66%) than among the ruling PPP (51%) supporters voice favorable views of Khan. Pakistanis overwhelmingly express positive views of their country’s military: 84% say it is having a good influence on the way things are going in Pakistan, essentially unchanged from last year’s 86%, but a significant increase from 68% in 2007. Consistent with 2009, large majorities of Pakistanis say the media (76%) are having a good influence, while smaller majorities express the same view about religious leaders (62%) and the court system (55%). However, the Pakistani police receive low marks from the public, and views toward the police have become more negative over the last year. Currently, 29% say the police are having a positive influence on the way things are going in the country, while 65% believe they are having a negative influence. In 2009, about four-in-ten (39%) said the police were having a positive impact and 55% characterized it as negative. Just one-quarter of Pakistanis say the national government is having a good influence on the way things are going, while a large majority (71%) says it is having a bad influence. Pakistani sentiment about the national government has grown increasingly negative in the last decade. The percentage describing the government’s impact as positive has fallen from 72% in 2002 to 59% in 2007 and 40% in 2009, before declining again in this year’s survey. Only 19% think President Zardari is having a good influence on the country, down from 27% last year. Fully 77% say his influence is negative, up from 68% in 2009.